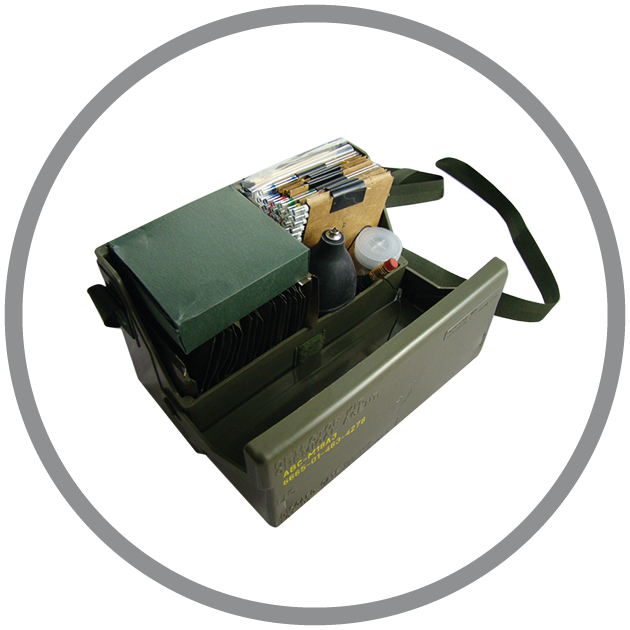 The M18A3 Chemical Agent Detector Kit is designed primarily for detecting dangerous concentrations of vapors, aerosols, and liquid droplets of certain chemical agents. Please note this product is currently unavailable. We apologize for the inconvenience. The M18A3 is considered a point-detector kit. The user can point a detector tube, or detector ticket, in the direction of a suspected chemical agent and sample the vapors, aerosols or liquid droplets in that area. If a chemical agent is suspected, but cannot be detected with the kit, vapor samples can be collected in sampling tubes for transportation to a laboratory for identification. In 2012, the State of California’s FIRESCOPE Standardized Equipment List, listed the M18A3 as a required item for emergency and Hazmat first responders. This product is considered toxic and must be shipped via freight carrier with HAZMAT restrictions in place. Reconnaissance in areas suspected of chemical agent contamination. Finding the boundaries of contaminated areas. Determining the absence of a chemical agent so that unmasking following a chemical agent attack can be initiated. Testing for the presence of a chemical agent after decontamination. Collecting samples of suspected but unidentified chemical agents.